This post was originally published by NEW INC on April 20, 2018 and is based on an interview between Lindsay Howard and Sougwen Chung. Recently NEW INC, the New Museum’s cultural incubator, and Nokia Bell Labs presented their first exhibition entitled “Only Human” at the Mana Contemporary in Jersey City, New Jersey. The exhibition showcases the work of NEW INC artistsSougwen Chung, Lisa Park and Hammerstep (Jason Oremus and Garrett Coleman) participating in the artist-in-residence program at Bell Labs and their collaboration with Bell Labs researchers to produce new artistic projects inspired or enabled by Bell Labs technologies. “Only Human” is available to visit Tuesdays - Saturdays at 3PM through June 2nd as part of the Mana Contemporary’s gallery tours. No RSVP is necessary. On Saturday, May 12th there is a day-long symposium at the Mana Contemporary for a deeper dive into some of the ideas, themes, and technological research that are being explored in the works on view. It will also reflect on the legacy of the Experiments in Art & Technology program (1967–2001), founded by artists Robert Rauschenberg and Robert Whitman, and Bell Labs engineers Billy Klüver and Fred Waldhauer. Please RSVP here. Image: Courtesy Jesse Untracht-Oakner/NEW INC. The interview below with Sougwen Chung provides additional insight into her practice and how her work with Bell Labs researchers has enriched her artistic experience during her year long tenure as an artist-in-residence. Lindsay Howard: What are some themes you’ve been exploring, and some past projects that relate to the research you’ve been doing at Bell Labs? They were written in 2002, when then the activities that mark us as human were much clearer. Now, in 2018, it’s likely more of a space to define, to demarcate. These speculations have driven my curiosity about working with machines—and co-evolving my artistic practice alongside expanding technological complexity. At Bell Labs, I'm exploring computer vision work and the robotic interface as a creative collaborator, from single mechanical unit to robotic swarm. LH: What is your day-to-day experience like at Bell Labs? Are you in a science laboratory? Are you in a research space? Are you working daily with an engineer or researcher? How do you balance all of that? SC: I have the privilege of being able to work with a diverse array of collaborators in my practice. This past year at Bell Labs has been the place where it's all come together. I’ve been able to take the divergent influences, ideas, and prototypes that I’ve been working on, and sit and reflect on them in the quiet space of my studio. I’m currently working on the formal prototypes for the robotic units that will make up my commission project. I’ve been working with artists and designers Andy Cavatorta and Scott Peterman, as well as a fabrication studio named Young Buk on the final iteration of the robotic system past the prototype. It’s been a joy to go from making decisions about the design, behavior, and hardware—the organs of this robotic swarm system—to the finished product with this incredible team. I’ve started calling one of the prototypes DOUGLAS because it’s the continuation of my previous drawing collaborations, or drawing with DOUG. LH: What does DOUG stand for? SC: It stands for Drawing Operations Unit Generation [1, 2, 3, etc.]. I think we’re on generation four now. ‘LAS’ stands for “Live Autonomous System.” It's definitely a bit of a mouthful and DOUGLAS is a lot friendlier. We’ve been working on design, programming, and fabrication simultaneously, while integrating it with feedback from my collaborator at Bell Labs, Larry O’Gorman, and getting a sense of how it’s starting to move and shape up at Bell Lab’s research facility. LH: What interested you in Bell Labs Researcher Larry O’Gorman’s work? SC: Larry started out in the privacy sector. Turns out that he was one of the major contributors to the fingerprinting technology that is ubiquitous in the world now. I thought he was such an interesting person to have a conversation with. From our conversations, I learned more about his career. Currently, he works on designing visual algorithms for public cameras that extract optical flow data from surveillance footage. LH: When did you decide to formalize this collaboration and partnership? SC: I think I always knew I would be working in some form with Larry’s research, in part because of the aesthetic qualities that his system could extract from a camera. There were visual features that shared similarities with my work—my gestural abstract work. I felt like there was a lot of harmony there. He actually sent me a paper after our first meeting about his work, and the paper was titled "Towards A Kinder Camera," which I thought was such an unusual sentiment to come from a research facility. LH: Sounds like he was anticipating, whether or not he knew [it], some sort of ethical responsibility. SC: In general, the willingness for Larry and for Bell Labs to be a part of that conversation is something I found to be really inspiring and compelling. They have this future human idea which, I think, on some level, is central to the contemporary artistic imagination as well. LH: What is the future human idea? SC: It’s not complicated. Very universal, and, again, a privileged dialogue to have. It concerns itself with questions like: What do people want society to look like in ten years? Our generation and the generation before ours have seen the internet turn into what it is today, from dial-up to Uber. We’ve been able to see the internet evolve, and we’re only just starting to reflect back on the past twenty years of this invention and how it’s influenced how we interact with each other, how we communicate, how we move around. Facilities like Bell Labs have an inside view into how digital technologies have shaped our culture, so the awareness that the decisions we make today can have a significant impact on society ten years from now comes naturally to their legacy and vision moving forward. The same can be said for artistic institutions—the idea of shaping the future through community and artistic artifacts while maintaining a cultural archive, a record of what was. LH: What have you learned about yourself, or what has most shaped your practice by collaborating with robots, and by collaborating with the technologies that you are describing? SC: Drawing, I think is one of the most humble art forms. 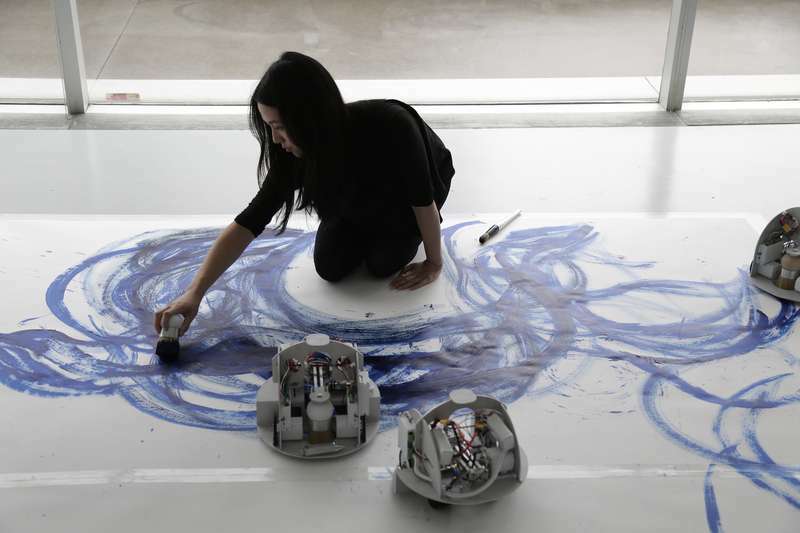 Being able to engage with mark-making in collaboration with a robot means not always knowing what I’m doing—and that has been really enlightening. It’s helped me work through and question what narratives we tell when we engage in collaboration with mechanical agents, and technologies in general. In the conversation of AI, that gets really broad—dystopian, utopian, occasionally fraught with controversy. When people think about AI there is a tendency to ascribe, or imagine, considerable agency. Something like an artificial consciousness, however far-reaching that might be. I’m compelled by the human capacity to anthropomorphize our relationship to machines, particularly to robots, and how that can end up being a mirror for how we view ourselves and our own interactions with others. There are didactic models that are encouraged by developments in IOT and voice interfaces. But the collaborative models are more interesting to me. It’s a new stage for examining authorship and agency. It starts to question, who is in control? Who do we want to be in control? Is that the point? 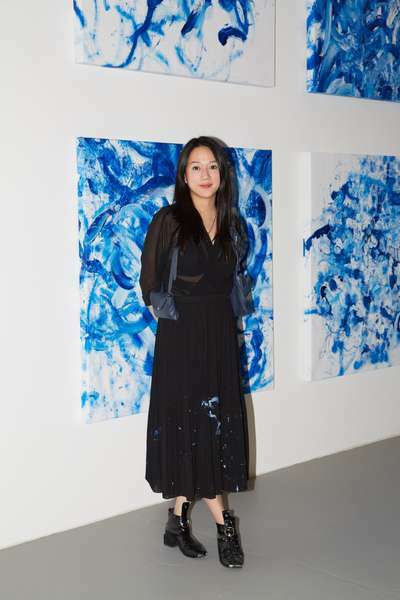 — Sougwen 愫君 Chung is a Chinese-born, Canadian-raised artist & (re)searcher based in New York.